These are some of the bands that Dave Perry has played with over the years. The Shore Things are the North Shore Music house band. Both Dave’s play in this band. 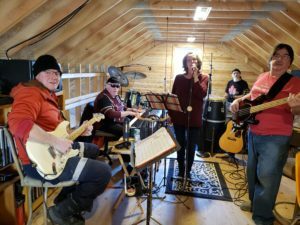 From Front to Back: Dave Curran on electric and acoustic guitar, John Sanzo on bass, Dave Perry on keyboards, vocals, drums, congas, and other percussion, Deb Dart on vocals, acoustic guitar, and percussion, and Charlie Dart on drums, and congas. The Shore Things consist a motley crew with various levels of talent. They include North Shore Music coaches and students. We can work with your band or help you put a band together. The Shore Things practice at the North Shore Music Loft location. They are hoping to play at local events this summer. Watch our blog for details! Jessica Benoit, Wayne Anonichuck, Jessica Palmer, Marie Perry and John Perry. 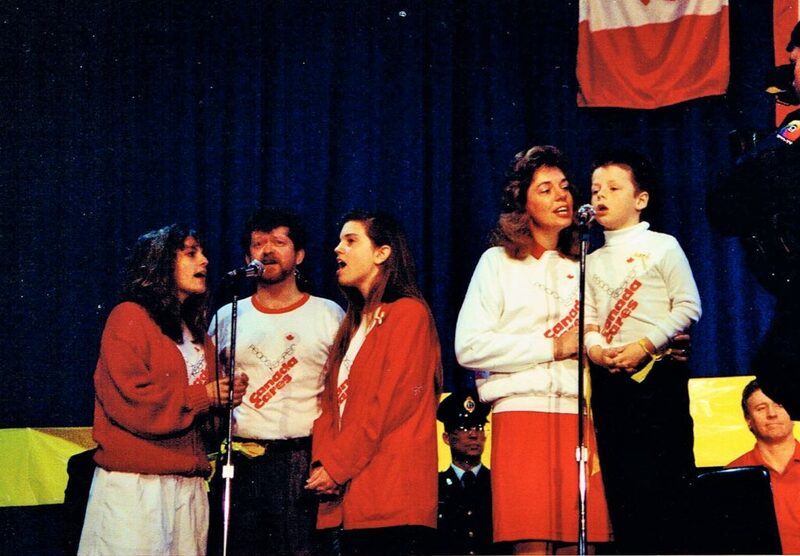 Canada Cares was written on the Thanksgiving weekend in 1985 when Bryan came to our home with a song idea to thank Canadian troops for what they do. His inspiration came from the overseas entertainment tours he participated on. We sat down, collaborated, and Bryan, Dave, and Marie wrote Canada Cares. It was not until the Yellow Ribbon Support Our Troops rallies during the Gulf War that our song gained recognition. Marie took the cassette tape to the rally being held in Oshawa and handed it over to CHOO Radio and stood back to watch. It became clear that they were listening and a few minutes later they played Canada Cares over the loud speakers of the CHOO van. Later that evening, Dave and Marie received a phone call from CHOO asking permission to play Canada Cares over the air! Of course they said yes and then contacted Bryan to let him know. We sang Canada Cares at all the rallies held in what is now the GTA, made the news every time, and were proud to be able to sing at the big welcome home rally in Toronto. The pictures below were taken at the Civic Auditorium in Oshawa for the local welcome home ceremony. The war was over and we were finally able to say yes to our son’s request to sing with us, after all, his grampa served in WW II. From Top to Bottom: Brett Piekarz, Randy Begg, Bill Hall, Linda Hall (Now Linda Begg), Dave Perry, and Dean Rundle. 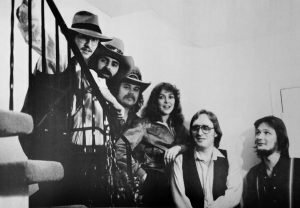 The Scott Street band rehearsed on Scott Street in Whitby and were together from approximately 1980 – 1985. 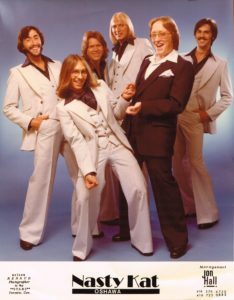 They played mostly in the Durham Region and Toronto area at places such as the Auto Pub in the Holiday Inn, The Georgian, The Red Barn, Whitby House, The Stone House, and at many high school dances including proms. The “Streets” also played at the Hawaiian Pavilion during Fiesta Week. 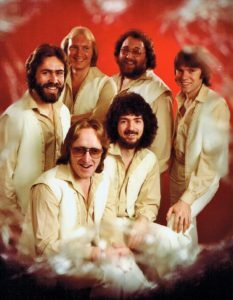 Back Row: Mike Yorkevich on drums, Rick Pritchard on guitar and vocals, Tyler Razienne on bass guitar, and Bob Gallant on guitar and vocals. Front Row: Brett Piekarz on keyboards and trumpet and Dave Perry front man and percussion. Nasty Kat played in the late 70s. 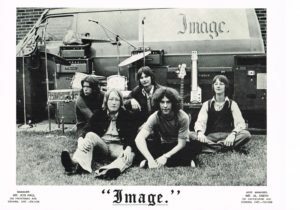 Back Row: Bob Reid on guitar and vocals, Tyler Raizenne on bass, Peter Bailey on drums and vocals, Brian Fraser on keyboards and vocals. Front Row: Dave Perry on lead vocals, congas, and percussion, and Dave Jacobs on saxophones, flute, percussion, and vocals. Back Row: Rick Pritchard on lead guitar and vocals, Dean Rundle on rhythm guitar and vocals, and Scott Rundle on bass guitar and vocals. 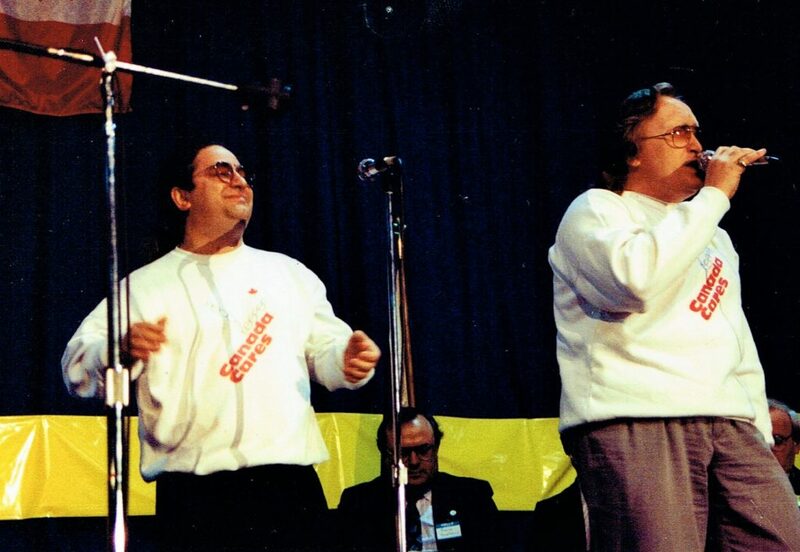 Front Row: Dave Perry on drums and vocals and Gord Kennedy on keyboards.